We recently reported on a magnificent story about an 8 year-old girl who fed the crows in her neighborhood and they in turn brought her gifts. Now we have another bird-inspired heartwarming story to share. 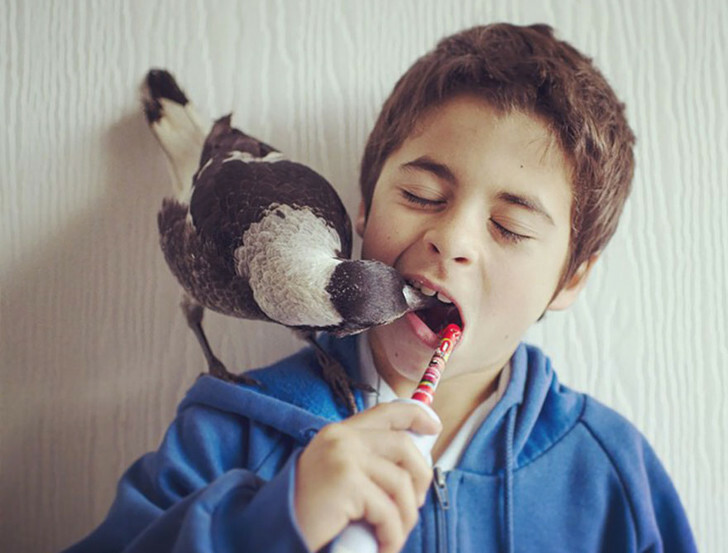 The Bloom family’s beloved feathered-friend, Penguin does everything a typical pet does. She cuddles and plays with the family like a dog… yet she's a wild magpie! 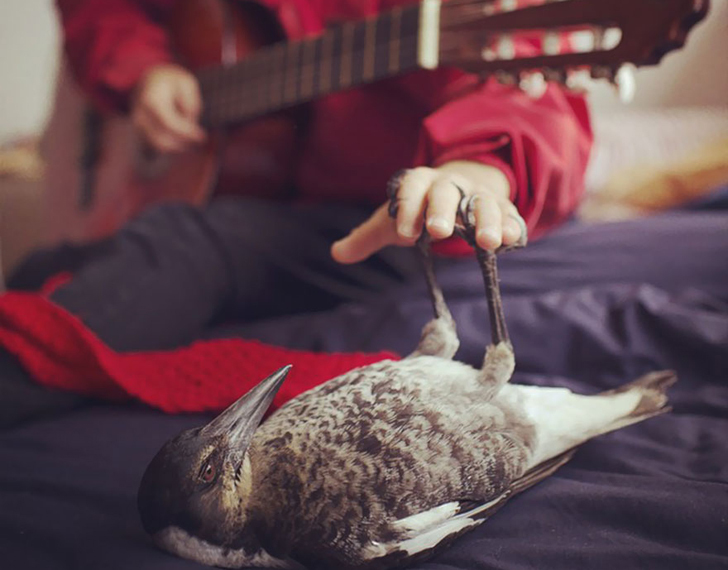 The Sydney, Australia-based family rescued little Penguin in 2013, when son Noah found the baby bird abandoned on the ground. After being nursed back to health, Penguin has become a mainstay around the Bloom’s house, becoming a part of their daily life and a cherished family member. The best part: Penguin is completely free to fly off and do her own thing in the world, which she does... but she chooses to be around her human family a great deal of her life as well. The Blooms initially intended to simply help the magpie get back on her feet, and release her back into the wild. But nurturing formed a bond between the bird and the Blooms that has kept Penguin coming back each day to spend time with them. Because of the Bloom’s love and affection, their feathered friend has grown to act more like a family dog. Penguin, named for her black and white coloring, has grown unusually, and adorably close to Cameron and Sam, and their three boys. Fond of cuddling and human touch, Penguin can often be found cozying up in the Blooms’ beds, sitting on their laps while watching TV or perched on the children’s computers during homework time. In the mornings, Penguin helps the boys get ready for school– even checking their teeth while they brush. She also joins the family for meals, picking at her vet-designed meal prepared by Cameron, and can often be found nuzzling on one of the family member’s shoulders. The unlikely pet has found happiness in her human family, and has made the Blooms a very lucky brood. You can follow their fun on Instagram. The Blooms initially intended to simply help the magpie get back on her feet, and release her back into the wild. But nurturing formed a bond between the bird and the Blooms that has kept Penguin coming back each day to spend time with them. Because of the Bloom’s love and affection, their feathered friend has grown to act more like a family dog. Penguin, named for her black and white coloring, has grown unusually, and adorably close to Cameron and Sam, and their three boys. Fond of cuddling and human touch, Penguin can often be found cozying in the Blooms’ beds, sitting on their laps while watching TV or perched on the children’s computers during homework time. In the mornings, Penguin helps the boys get ready for school- even checking their teeth while they brush. She also joins the family for meals, picking at her vet-designed meal prepared by Cameron, and can often be found nuzzling on one of the family member's shoulders.